Tassarin Nemeth is Okinawa’s best known Thai lady. She has an unusual resume, to say the least. Tassarin is a certified Thai masseuse, a former Thai restaurant owner, has worked in the hotel industry and also for a medical charity near the war zones on both sides of Thailand, her home country. Tassarin is also qualified in making and fitting prosthetics used on victims of the landmines triggered in fields along Cambodian and Burmese borders. 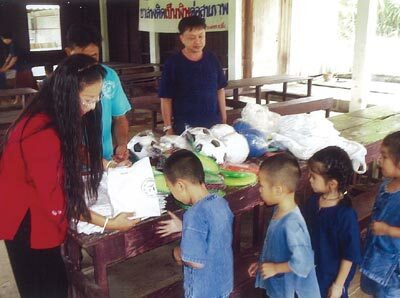 Today, she is organizing a charity drive to benefit HIV orphans and homeless northern Thailand youth. Tassarin, Director of the Thai Education Center Okinawa, is offering traditional Thai massage now through December 24th, with all proceeds going to food, winter clothes and sports equipment for underprivileged youngsters. Massages are available daily from 9am to 8pm. Appointments may be scheduled at 090-4471-0171, or by emailing tassarin@nemeths.us. For those that don’t want a massage for themselves, Tassarin has gift certificates available for presentation in the purchaser’s name. Tassarin qualified in Thai massage at Wat Po, one of Bangkok’s main temples. She’s also skilled in the northern Thai massage style, which she prefers. Massage is considered the best way to ward off illness and stress, she says. The art of Thai massage dates back thousands of years to India, and is based on the thery common to Ayurevedic medicine, Chinese acupuncture and Japanese shiatsu. She skillfully works the muscle points, or meridians, that channel energy throughout the body. Thai massage begins with cleaning the feet, then rotating them and working pressure points on the soles. As in Chinese and Japanese traditional medicine, every part of the sole is believed to have a corresponding body part that can be improved by touch. From the feet, massage works up the shins, calves and thighs, using elbows and feet as well as her fingers and thumbs to stimulate the pressure points. Thai massage doesn’t use oil, and the subject wears loose fitting pajamas throughout the session. Thai massage typically is an hour, although two and three-hour sessions are often selected. Tassarin met her husband, a retired Marine, in 1998. She says she met him at 7am, he proposed at 9am, and she’s been in Okinawa ever since. Before leaving Thailand she worked in hotel customer relations in Chieng Rai and other areas of the country, and Laos, in the early 1990’s. Here in Okinawa, she operated Bangkok Kitchen in Ishikawa until 2000. She still does catering and special events. She’s a Thai culture promoter, actively involved in Thai holidays, customs and culture events. She leads Thai festivals, including Loy Kratong Festival, one of the country’s oldest traditions, where Thai Buddhists float the Kratong, a lotus shaped boat, to show gratitude to water spirits.